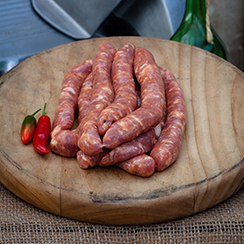 Casalingo is the most delicately flavoured of the salami family and does not rely on any heavy spices for flavour. 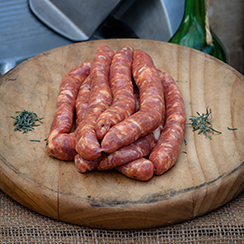 Casalingo means a salami made at home in Italian and started from the Italian tradition of each household making salami to store their pork for year-round availability. Some households made it better than others. 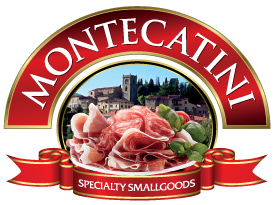 INGREDIENTS: Australian Pork (MIN 90%), Red Wine (contains sulphites), Garlic, Salt, Seasoning, Antioxidant (316), Liquid preservative (223). Salsiccia fresca (literally meaning “fresh sausage”) ready for cooking and encased in a casing infused with spices and the added punch of Chilli in the hot version. INGREDIENTS: Australian Pork (MIN 90%), Salt, Seasoning, Antioxidant (316), Liquid Preservative (223) + chilli. 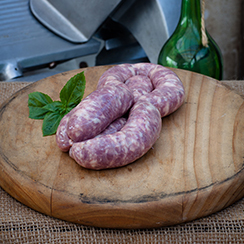 A style of fresh pork sausage noted for being seasoned with fennel and/or anise as the primary seasoning.